Don’t gimme that “its only 2 games” bull crap, either. Did you realize that its the first time in almost 3 years that the O’s have beaten Boston twice in a row? The fact that they pulled it off in a short, two-game series so that we are able to call it a sweep only makes it that much sweeter. For the 2nd day in a row, the O’s overcame an early 3-0 deficit. Yesterday, the Sux put up 3 in the first inning off Jeremy Guthrie, never to score again. Today, D.Cab (who had lost 7 straight against Boston) scattered 10 hits very effectively through 7 innings, as 2 of Boston’s 3 runs off him came via the solo home run. Cabrera continued his newfound mastery of the strike zone, issuing not a single walk in the outing. Still, when he walked off the mound for the final time today, Cabrera, like Guthrie yesterday, saw his team trailing on the scoreboard. 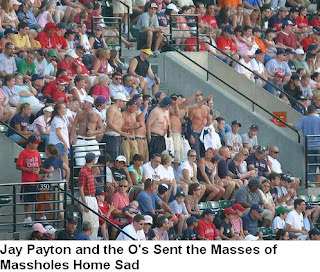 Jay Payton’s 2-Out, 7th inning GRAND SLAM, a screaming liner down the left field line, put the O’s up for good, and more solid relief from the ‘pen sealed up the ….. wait for it …. of the sux, sending the hordes of migratory Sux fans (many of whom likely made an entire two-day event out of this whole thing – our local economy thanks you, by the way) to go cry in their beeahs back in Bean Town – hey, maybe they’ll be lucky enough to listen to the Celtics lose game 6 to the Cavs on the radio on their drive back). Better luck next time, suckahs. Speaking of relief pitching, a HUGE B’More Birds Nest Ups goes out to Jim Johnson. In case you missed it, Jimmy and Manny Ramirez engaged in an epic 10 pitch battle with the bases loaded and nobody out in the 7th of Game 1, which culminated in Manny Bouncing back to the pitcher for the 1-2-3 double play. Johnson then got Mike Lowell to fly out – an outstanding performance in a very intimidating situation. 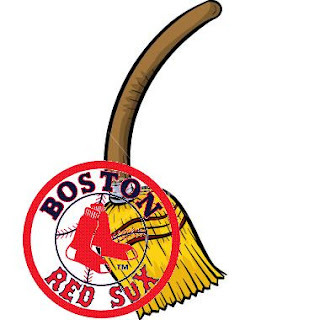 Anyway, so in case you didn’t hear, the Birds swept Boston this week. Also, they took 3 of 4 in Kansas City to finish their last road trip up at a decent 4-6. The Birds are now 21-19, 2.5 games back of the first place….Devil Rays?? You know what? I’m very much OK with that. If it’s not gonna be us this year (and yeah, I know, it’s more than likely not), then yeah, I’ll be a Rays fan by default. Lets hope they can keep up their stellar play and keep both the Sux and the Yank Offs out of the postseason this year. The upside down AL East is a welcome sight after all these years. On deck: Another day off, then the Nats travel up 95 for the start of interleague play this weekend. In the hole: The O’s travel to New York and Tampa next week. This entry was posted on May 14, 2008 at 9:46 pm and is filed under Orioles, Orioles Week Review. You can follow any responses to this entry through the RSS 2.0 feed. You can leave a response, or trackback from your own site. First sweep in 3 years?? lol, congrats…it’s the little things that count. I too am impressed with the way the Rays are holding down 1st place. Though I think it’s way too early to crown them the AL East winner. Those RedSux and Yankoffs have an uncanny way of scrapping out a couple wins after the All-Star Break to get within playoff contention.